Quick Overview: Non-asbestos sheet is made from special non-asbestos heat-resisting fiber, natural rubber compound heating and compression molding. It eliminates asbestos rubber sheet essentially and thoroughly. 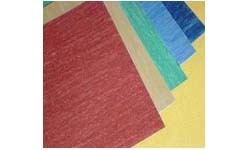 Synthetic Fiber sheet is made from kevlar fiber, natural rubber, aramid fiber, filling materials and dye. Compressed and calendered under high temperature and pressure into a sheet form. It eliminates Synthetic Fiber rubber sheet essentially and thoroughly. * Can be used in food and medicine industrial.